The first rule in handling and caring for old photographs is “do no harm”. While these are technically correct, in the everyday world, the most damaging force is people causing damage with poor handlling habits. Do not frame directly under glass - image may bond with the glass and then peel off when removed. Store in archival boxes or non-acidic containers. 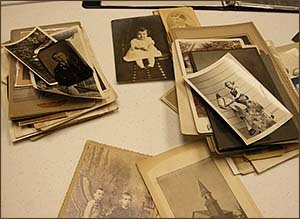 Place each photograph in an individual sleeve. Do not store bare images next to each other, photographic chemicals can leach from one to another. Do your pictures look like this? Do not write on photographs with marker pens! Even the backside. These will bleed through the image eventually. Avoid ball point pens also. Chemicals in all inks can damage an image. Use a #2 pencil. The graphite in the pencil is inert (won't react with image), will last forever, yet can be removed. Do not continuously display original versions of image. Damage from sunlight, direct or indirect, is irreversible. Store prints in acid-free plastic sleeves. Do not store in environments were humidity is extremely high or low. Ideal humidity is 30% - 50%. Any serious photograph collector, whether amateur or professional, will benefit from a copy of Care and Identification of 19th-Century Photographic Prints by James M. Reilly. This 1986 book published by Eastman-Kodak Company is currently out of print. Copies can be found on various auction or internet sites. This is a technical book that goes into great depth describing the various chemical and physical properties of photographic prints. It does review daguerreotype, ambrotype, and tintype processes, but concentrates on paper-based photographs.